I have a new stamp set to play with, so I wanted to make a card. I found the inspiration for the card on two other websites. 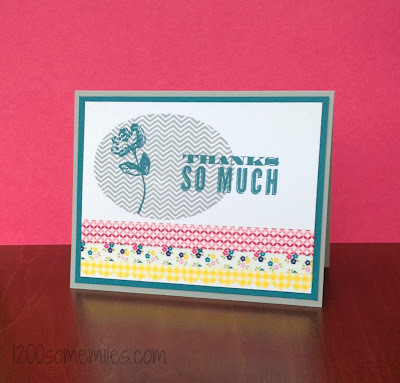 Jennifer posted some great card ideas with this stamp set and Shimelle's blog showed a fun idea for adding a scalloped border to washi tape. 1. To make the card base, cut an 8 ½ x 11 inch piece of Smokey Slate card stock in half. 9. Use scratch paper and the Scalloped Edge Border Punch to add the scalloped edge to the third piece of wash tape before adhering it to the bottom of the Whisper White sheet. 10. Adhere your Whisper White piece to the Island Indigo piece and then adhere to the Smokey Slate card base. Super cute. I have the washi tape too, just have broken it open. Must do now!